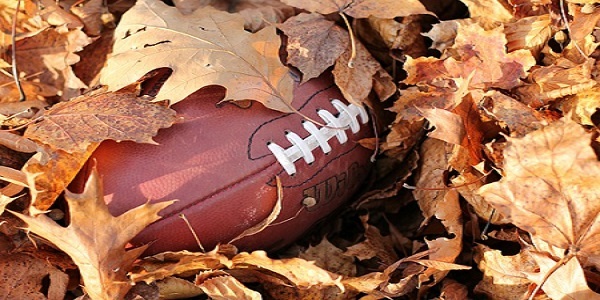 The National Football League (NFL) has become America's most watched and largest grossing sport. Each weekend, tens of millions of people sit down and watch teams battle rain or shine, hot or cold, which adds to the intrigue of each match-up. Some of the greatest NFL games have occurred in adverse weather, including the 2001 AFC Divisional Game in New England during a snow storm, and the 1967 "Ice Bowl" at Lambeau Field where the temperature was -15 degrees F with a wind chill of -48 degrees! While the vast majority of games are not played in such extremes, it is still common for weather to have an effect on players and the outcome of the game. In what ways you ask? The answers are below. 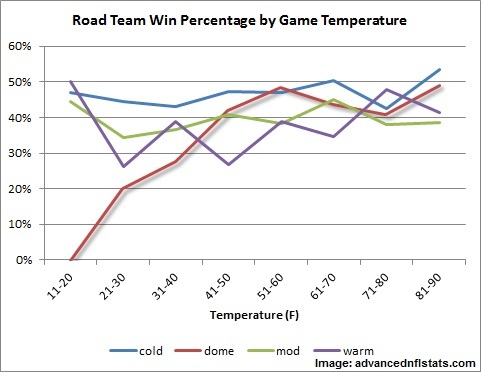 In a study performed by advancednflstats.com, teams were broken up into four categories based on climate: warm, moderate (mod), cold, and dome. When assessing possible weather factors that can affect the outcome of the game including precipitation, wind and temperature, it appears that temperature can make the biggest difference. For the most part, wind affects all teams equally by decreasing passing efficiency by approximately 0.5 yards per attempt at 15 - 20 mph or greater. Teams also have a tendency to run the ball more often at that point, which you might expect. Precipitation, whether it be rain or snow, for the most part appears to affect teams similarly, although data is lacking because of its infrequency. Find more football facts about weather at advancednflstats.com. On the other hand, there are some eye-popping statistics about how temperature affects teams. In particular, dome teams suffer the most, which can be seen in the chart above. Dome teams win less than 20% of games played at cold weather stadiums when the temperature is 30 degrees or below. From 2000-2011, this scenario occurred 23 times, with the dome team winning just 3 games! Warm climate teams don't fair much better, winning approximately 35% of the time playing at cold weather stadiums (when it is cold). For reference, the league average winning percentage for away teams is 42.7%. Looking at the league as a whole, it appears colder weather effects completion percentage and the amount of drops. The league averages 61% passing completion to start the season in September, but only 59.2% in December and just 56.4% in January. Drops per game become increasingly higher by the winter, rising 0.5 - 1 per game. It is clear that weather does in fact affect the outcome of a football game. Wonder if Vegas takes these stats into account when making their lines?